...a small, worn cardboard box held my first collection of stamps, sealing wax, string, papers and pencils. Anything I could get my hands on was subjected to my creative whims. (this might explain my pack-rat tendencies! )...I love to make lovely things. Even better is to share these handmade objects with others. A degree in Fine Arts and over 15 years in the field of graphic design have refined my aesthetic sensibilities, but the little girl holding out a lovingly hand-drawn piece of stationery is still in there. I make these things and I revel in the sheer beauty of the process, but the idea of sharing this joy (of spreading the love around) just makes me happy. I create ready-made collections as well as custom stationery. I really enjoy collaborating with my clients to create something that reflects their personality. Whether it's custom notecards, wedding invitations, baby announcements or business stationery - every project is a new adventure and a source of continuing inspiration to me. Check out my shop to see what is currently available or get in touch if you would like to discuss a custom project. 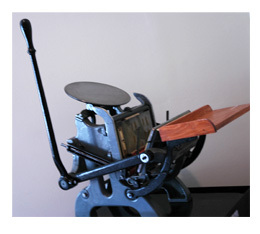 Letterpress printing is an artisanal process, every print is crafted entirely by hand and therefore subtle variations in color, inking and placement are to be expected. Each piece is a small work of art - lovingly scrutinized and carefully constructed to produce a beautiful result. You can view work samples on my portfolio page or visit my blog 'Phillips Creative: In the Studio' to see a broader range of my creative projects and get a glimpse of what I'm currently working on.